Kukio Blue Water Swim proudly supports The Nature Conservancy's marine conservation work on Hawai'i island. A portion of each entry fee will be donated to their efforts. The Nature Conservancy conserves the lands and waters on which all life depends, and envisions a planet where people and nature thrive. The Hawai'i Island team helps communities in West Hawai'i identify their top marine conservation challenges and develop effective solutions that integrate science and traditional knowledge. The Conservancy is an international, science-based organization operating in 72 countries and all 50 states. Its global focus is to work with partners to address the greatest challenges of our generation: protecting lands and waters, providing food and water sustainably, mitigating climate change impacts, connecting people and nature, and building healthy communities. Gates will open at Kukio at 6:00 AM. All event parking must take place at Kukio, there will be no event parking at Kua Bay. Please allow 15-20 minutes to walk to the registration/check-in area at Kua Bay from the parking area at Kukio. Directions to Kukio Golf & Beach Club: 87 Mile Marker Queen Kaahumanu Hwy, Kailua Kona, HI 96740. From the Kona airport drive 6 miles North on Queen Kaahumanu Hwy, turn left at Kukio Nui Drive. You will arrive at the Kukio Security hale. They will direct you on where to park. Please note: Take only what you need for the swim to the race check-in. A small gear bag will be provided during registration. Please pack your belongings into the appropriate bag during registration and take it to the designated drop-off area. All items must fit INTO the provided gear bag. Your gear bag will be available for you once you finish your swim. Event organizers are not responsible for lost items. Personal bags or backpacks will not be accepted. Awards will be given to the Overall Male & Overall Female finishers. Awards will also be given to the top 3 finishers in each age division, male & female. Please note: Fins & snorkels are permitted but individuals using fins and/or snorkels will not be considered for the age group or overall awards. You will receive a finishing time which will be listed under the Snorkel/Fin division. 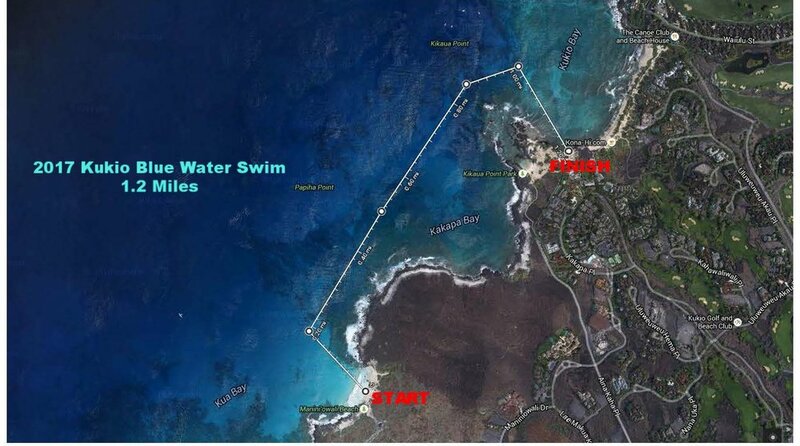 The swim will be a beach start at Kua Bay (Maniniowali Beach), swim 1.2 miles to Uluweuweu Bay and finish by running up the finishing chute at Kukio Beach. During the swim, keep all buoys on your right. Water safety volunteers will be on the course, please follow their directions. *Race course is subject to change depending on race day conditions.